336 pages | 12 B/W Illus. Part 1: Introduction. 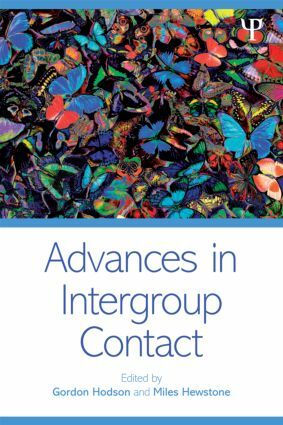 G. Hodson, M. Hewstone, Introduction: Advances in Intergroup Contact. Part 2: Potential Obstacles to Positive Intergroup Contact and Directions for Circumvention. J. D. Vorauer, Getting Past the Self: Understanding and Removing Evaluative Concerns as an Obstacle to Positive Intergroup Contact Effects. G. Hodson, K. Costello, & C. C. Macinnis, Is Intergroup Contact Beneficial Among Intolerant People? Exploring Individual Differences in the Benefits of Contact on Attitudes. S. Lolliot, K. Schmid, M. Hewstone, A. Al Ramiah, N. Tausch, H. Swart, Generalized Effects Of Intergroup Contact: The Secondary Transfer Effect. T. Saguy, L. R. Tropp, D. Hawi, The Role of Group Power in Intergroup Contact. Part 3: Building Intimacy in Intergroup Contact: Preludes and Processes. R. J. Crisp, R. N. Turner, Imagined Intergroup Contact: Refinements, Debates and Clarifications. T. V. West, J. F. Dovidio, Intergroup Contact across Time: Beyond Initial Contact. F. E. Aboud, C. S. Brown, Positive and Negative Intergroup Contact among Children and its Effect on Attitudes. K. Davies, S. C. Wright, A. Aron, J. Comeau, Intergroup Contact through Friendship: Intimacy and Norms. Part 4: Methodological Concerns and Future Considerations. O. Christ, U. Wagner, Methodological Issues in the Study of Intergroup Contact: Towards A New Wave of Research. G. Hodson, M. Hewstone, H. Swart, Advances in Intergroup Contact: Epilogue and Future Directions. Gordon Hodson is Professor of Psychology at Brock University (Canada), where he is Director of the Brock Lab of Intergroup Relations (BLIP). He is currently an Associate Editor at the Journal of Experimental Social Psychology. His research interests involve prejudice and discrimination, with an emphasis on individual differences (e.g. ideology), emotions (e.g. disgust, empathy), and intergroup contact. Miles Hewstone is Professor of Social Psychology and a Fellow of New College, Oxford University (UK). He has written two books and edited over twenty volumes, publishing on attribution theory, social cognition, stereotyping, and intergroup relations. He is the recipient of numerous awards, and has been elected to the British Academy (National Academy for Arts and Social Sciences).